RIM and keyboards. If there is one thing hardware related that BlackBerry is known for, it's their physical QWERTY keyboards. Don't believe us? Just check out the QWERTY on the BlackBerry Bold 9900/9930. The history of RIM on the virtual QWERTY side is not as impressive. The SurePress process on the BlackBerry Storm was meant to emulate the pressing of a real keyboard. It was a gutsy experiment for a company that never had a touchscreen phone before, but it failed. Even adding sensors to the BlackBerry Storm 2 could not improve the keyboard. The BlackBerry Torch 9850/9860 revealed a new virtual QWERTY keyboard. But it didn't seem to generate the excitement that video clips of the new BlackBerry 10 keyboard did. The major reason for the stir was the word prediction engine. Similar to other phones, when you start typing, the phone predicts the next word and displays it. But while other handsets show the words in a horizontal row above the QWERTY keys, the BlackBerry 10 keyboard displays the suggested words right on top of the keys based on the first letter of the suggested word. And behind the word prediction engine is a newly patented logic-based text prediction engine. RIM has received a patent (8,224,393) for this, which was originally filed in May of last year. Instead of searching for typos, the software is combing over the words you've typed, looking for context and often-used expressions to come up with the predictions of the next word. Unlike the word-prediction engine on other phones, the patent filing indicates that RIM's word-predictions are not based on the frequency certain words are used by the handset's owner. This is obviously good news for RIM. If the applause for the BlackBerry 10 QWERTY keyboard extends to the phones themselves, BlackBerry may not just survive but might even thrive. And having a patent on a key element of RIM's turnaround should allow CEO Thorsten Heins to get some sleep at night. Well good for RIM. They need some good news lately. Nice, that's a solid accomplishment for RIM. I liked the keyboard from what I saw in BB10 demos, so it could potentially hold the best keyboard title yet again while preventing other companies from copying the methodology. it's different.. I was about to say the same, but then the last line of the second paragraph tells me.. "Unlike the word-prediction engine on other phones, the patent filing indicates that RIM's word-predictions are not based on the frequency certain words are used by the handset's owner." SwiftKey uses the frequency of the words used by us, and hence the SMS personalisations, but this is using another type of logic, which is different from SwiftKey's logic. Similar, but still different.. Just saying..
Read the patent, just saying... "A method of disambiguating a text input into an electronic device that comprises a keyboard and a memory having a plurality of words and associated ***frequency values*** stored therein, the method comprising: receiving an input; determining that a portion of the input includes an ambiguous text input; identifying in the memory a set of words that represent potential word matches for the ambiguous text input; determining from the set of words that a first word in the set is a preferred potential word match for the ambiguous text input, based on a comparison of the associated frequency values for each word in the set of words; displaying at least a subset of the set of words, including the first word and at least one other word selected from the set of words; detecting a selection of a displayed word from the subset of the set of words that is different from the first word; and responsive to a completion of the input that includes the selected word, revising the frequency value associated with one of the first word and the selected word." 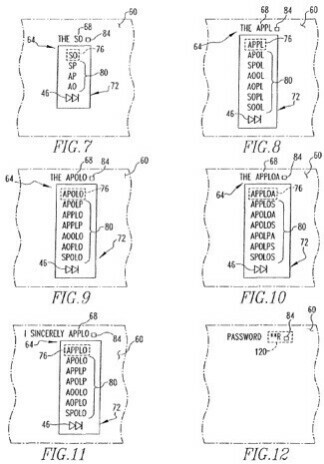 Don't rely on Phone Arena to actually read a patent... they often have no clue what they are in fact talking about.